The room project is marching on. Little by little I’m getting there! Homeschooling is getting closer to a close for the year and that’s giving me a little more time. It’s also making me itch for summer and more freedom to do more fun projects without school hanging over my head! This post will be a tad shorter since there aren’t too many additional projects left to do. The painting of the previous week took a lot more time and space and strategic planning so that I wasn’t painting with a crawling infant or have a wet drawer in reach of my crazy three year old who can’t remember from one minute til the next that the paint is STILL wet! My first project was the lamp shade. The iron floor lamp and cream shade is nice, but plain in my book. I’m sure that would suit many just fine, but not me! It was given to me from a dear friend and I had been looking for a new shade to brighten the room, but the prices on them are rediculous! So I did decided I wanted to add some fabric flowers to the shade. I looked through my fabric scraps, pulled out the hot glue gun and set to work during an afternoon nap time. I was cleaned up and project completed by the time they were awake! It was a very rewarding nap time! I do really like it and enjoy the added color it adds to the room… however… I think I want more flowers on it! I haven’t gotten to it yet, and maybe it will be a summer project, but I think I may add some more flowers and to cover 75% of the shade instead of the current 25%! Next, the chair/side table next to my side of the bed. This probably could have gone with the free furniture post, but Brian found this chair on the side of the road and grabbed it for me! 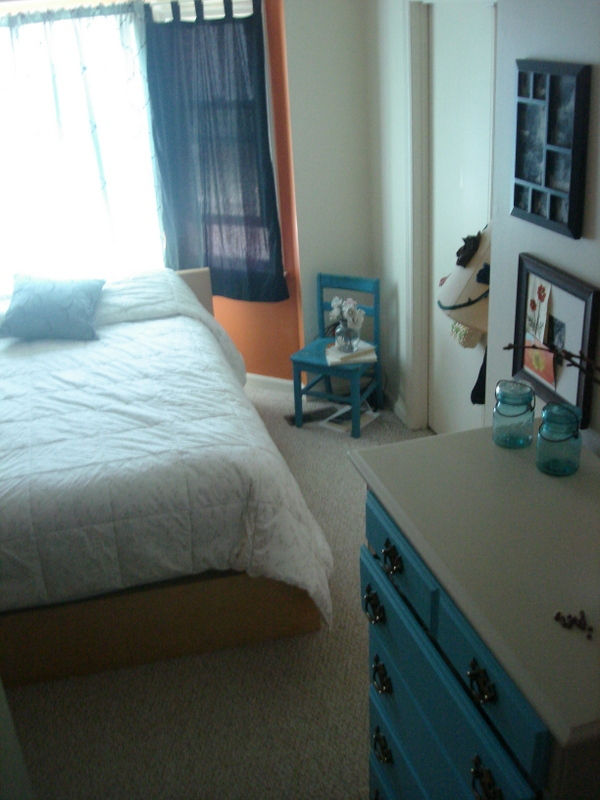 I didn’t repaint it and the color matches almost perfectly with the other blue in the room! 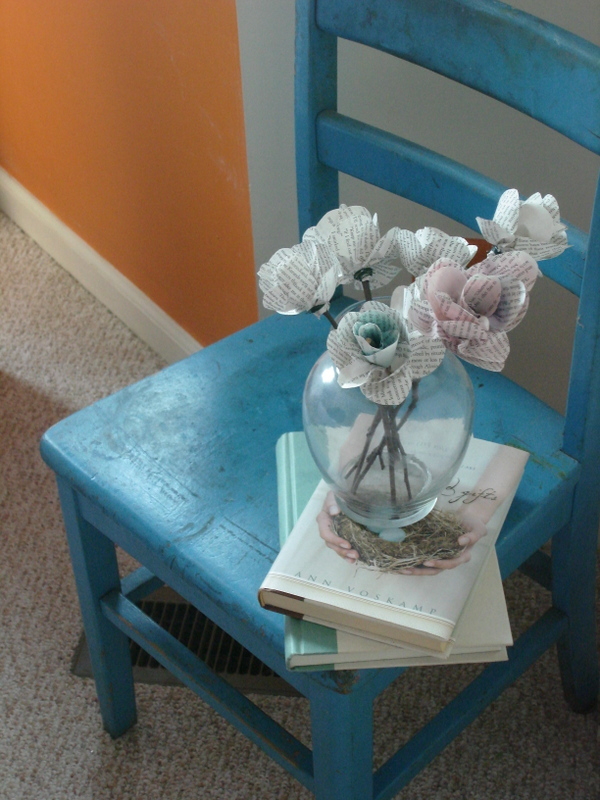 To add a little decor to a simple chair I just added two books and a vase of “book flowers”. These flowers I made two years ago for Christmas gifts and just made myself a set as well. They don’t take too long and they have lasted for 2 years and counting. The kids have knocked them off the chair a handfull of times. They have lost a few of their pettles, but are still going strong! And lastly, my dresser. I used to have a LARGE leather jewelry box that sat on top of the dresser, but it just looked like a big brown leather box without much character. 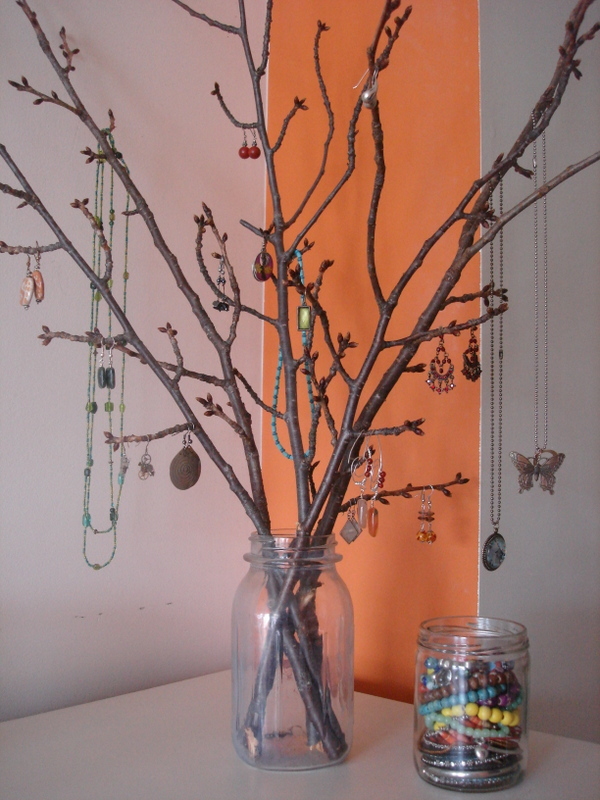 I’ve always liked the different ways on pintrest to display the jewlery and store it but still look nice. I thought of adding wire mesh to frames and use that to hold the earrings, but then I still had bracelets and necklaces, and I do have quite a bit. But it just wasn’t exactly what I wanted. So… I asked Brian to get me branches from cherry trees that had buds, but no blooms yet. So he found them for me! I was afraid he was going to miss them and start looking after they burst into bloom, but he surprised me! They are perfect. Originally I was thinking of painting them blue before hanging the jewlery on them, but I actually really like the natural color of the branches in contrast with the orange wall. They also match the wardrobe really well and tie the colors together well. So there! 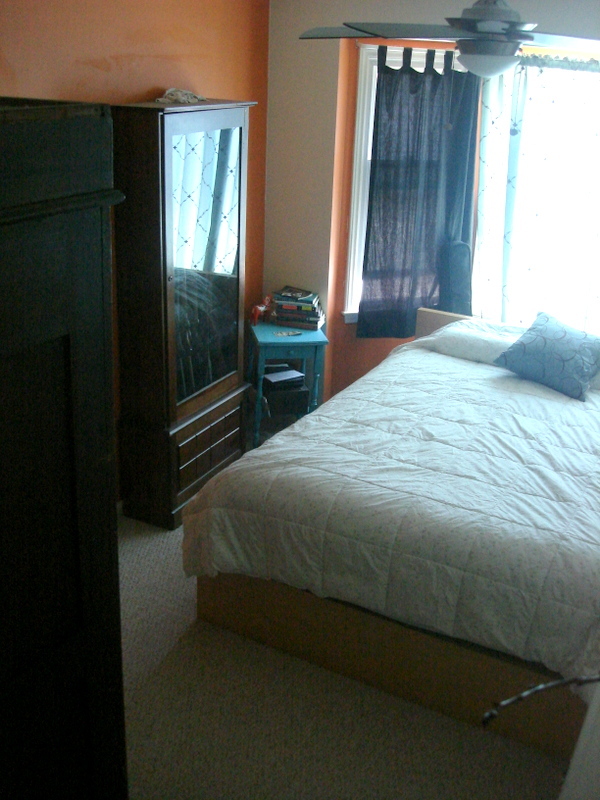 My new room. Here is the best I could do for a final peak! Next you are visiting and you want a real look, just ask! I can’t promise it will be as neat and picked up as in the photo here, but you are still more than welcome to check it out! Have you had any new crafts recently? I’d love to hear! Thanks! You set the time and we will be there! An internet search first (especially on pinterest) is good to see what you like and what designs make you happy, relaxed, energized, etc.